We traveled to Nairobi, Kenya as a jumping off point for the safari and the Mt. Kilimanjaro climb. We stayed there one night on the front end of the safari, then returned after the climb to plan the next steps of our trip. In Nairobi we met up with our friend Tonya, who had organized the safari and climb, and on whose plans we were piggybacking! The second trip to Nairobi marks the end of the first five planned weeks of our trip. From this point on we had to wing it! Internet connection speed: Local ISP access at 24.6. Working stoplights: one intersection (others have lights, they just never work, and will not be fixed). 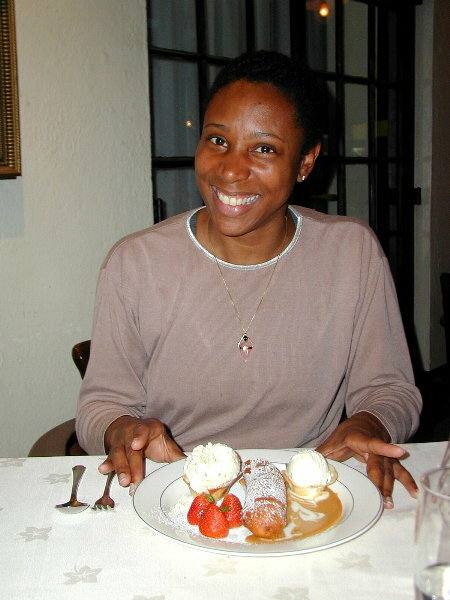 Our friend, Tonya, about to eat a very interesting dessert! Kristen putting together our post-kili climb smelly laundry. 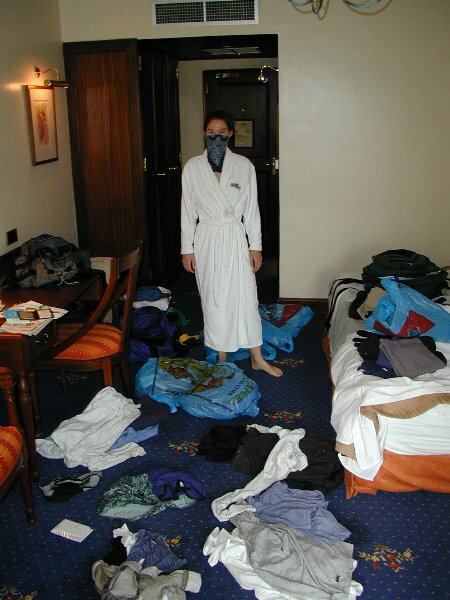 $151 for hotel laundry service -- the price we pay for living out of hotels! 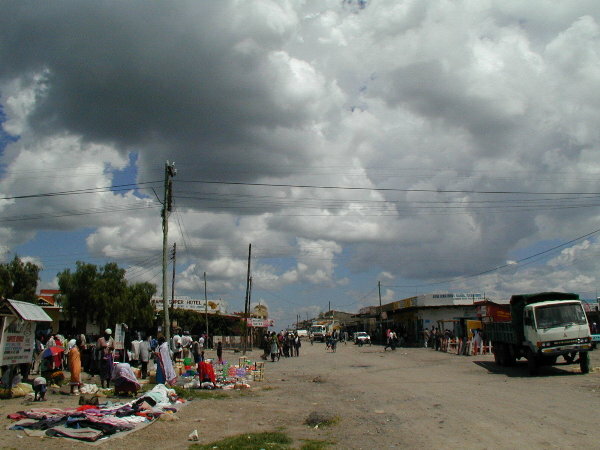 A typical Kenyan marketplace on the main road from Arusha to Nairobi. We hooked up with Andrew, our friend from Atlanta (Christine was out of town) who now lives in Nairobi. 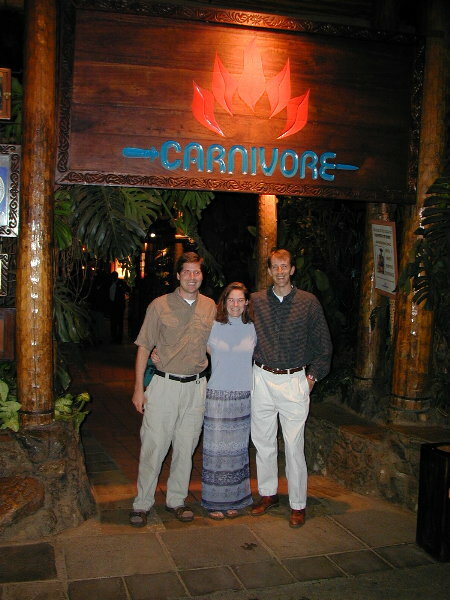 He took us to Carnivore -- a meat lover's dream restaurant. Our wonderful family (esp. 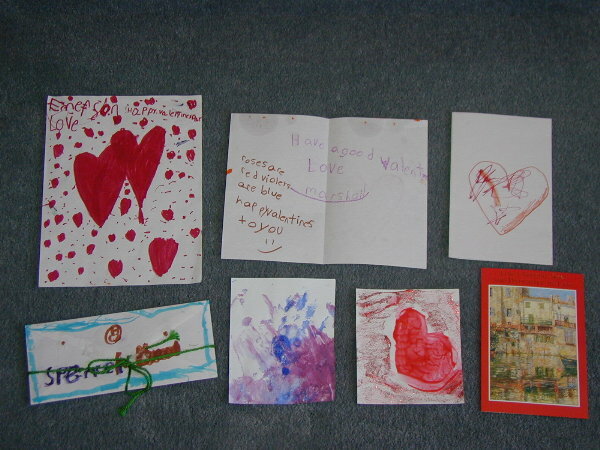 nieces/nephews) Fedx'd us Valentine's Day cards so they would be there on Feb 14! When we left the airport on our first pass into Nairobi, we saw giraffe in the fields just beyond the fence -- we knew we were in Africa! We stayed in the Norfolk Hotel, supposedly the nicest hotel in Nairobi -- A&K puts all their guests at this hotel. It was very nice, as long as you get the newer rooms. We tried to work through A&K on our second pass through Nairobi to set up flights to and hotel in Cape Town. Unfortunately, we could not get a response in our short 1.5 days in Nairobi, so we used the hotel travel agent to get us a flight out the next morning, and went to Cape Town without a hotel reservation. We could have done it ourselves, but the MCI access line was out of service for the whole last night, so we could not call the hotels directly. Our friends from Atlanta, Christine and Andrew live in Nairobi, so we planned to get together with them. Only Andrew was in town during our one free night, so he took us to Carnivore, a pretty famous restaurant focused very much on tourists. The menu is a set menu. They bring you bread, soup, salad/condiments, then a never ending stream of meats cut from huge skewers directly to your plate, followed by dessert. The meats included beef sausage, roasted beef, lamb, pork loin, pork ribs, crocodile, elan, and zebra. New meat was offered at all times. We ate more meat at that sitting then we have over the past few months! We flew from Sao Paulo to London for a short stopover (see London - Getting There) and then a late night flight from London to Cairo, then overnight to Nairobi. The Cairo-Nairobi flight was our first flight off our Round-The-World fare. We did research before we left and found the 12:15AM-6AM to be the only direct flight to Nairobi. All the other flights flew through other countries and took a total of about 15 hours. We knew we were cutting it close because the London flight was not scheduled to land in Cairo until 11:05PM and the Egypt Flight from Cairo to Nairobi took off at 12:15AM -- 70 minutes between international flights in a strange airport was risky. But we had little choice because we could not leave the Amazon Basin earlier and we had to be in Nairobi for the safari on Monday. The London-Cairo flight took off 45 minutes late, making our 70 minute layover in Cairo very worrisome. We asked the British Airways contact in London about the Cairo airport and she said that our flight arrived in terminal 1 and our flight to Nairobi took off from terminal 3, and she thought that they had a bus running between terminals every 1/2 hour. Hmmm... She promised to alert British Airways personnel in Cairo to help us transfer quickly. It turns out the London-Cairo flight made up time in the air and we landed at 11:25PM -- 45 minutes to make our Cairo-Nairobi flight. They let us off the plane first, and then an attendant took our baggage claim tickets and told us to run to the 'transit' area of the airport. We ran until we saw a 'Long Wait -- Transit' sign (?!?) and stepped through the security station. It was a very large room completely empty except for a guy at a desk and a guy across the room in a chair. We explained to the guy at the desk that we had to be on the Cairo-Nairobi flight with our bags by 12:15AM and he just laughed, saying "no, no, no, ...". We waited until he stopped saying no, and asked him to do what he could. He took our passport numbers and called the other guy over. This other guy told us to follow him as he started running. All three of us ran out a side door of the airport, onto the tarmac and into a tiny van. He drove us over to the baggage area with all the baggage handlers waiting for the bags to be brought from the plane (we assume this is all 'restricted area', like it is in every other airport in the world). Of course we did not have our baggage tickets because we had given them to British Airways attendant -- the Egyptian airport driver could not understand this. We waited for the first shipment of bags off the plane, and watched as they unloaded them onto the conveyor belt. Our bags were not there. Our driver looked at his watch and shook his head -- 11:35PM. Then we waited on the next set of baggage cars -- still not there. At 11:45, the driver told us we had to go, and they would try to find our bags and get them to us -- we described the bags in detail. Then he put us in the van and took us for the ride of lives. We drove across pitch black runways, around buildings, reaching 60+MPH and catching air over bumps on our way to our departure area. We just looked at each other in amazement that this was happening. For all we know he could have been taking us to some back room to rob us! We must have driven 10 minutes in that crazy van holding on for our lives! We skidded to a stop in front of what looked like International Departures. I gave the guy $20 and thanked him hugely for the help. He told us he would go back and try to get our bags. But first he walked us through security, jumping over the railings, and around the passport control guys to the ticket counter, and told them to expedite us (glad we were not terrorists!). Of course, they told us to sit down and wait. 12:05AM. The driver was back and he had found our bags! He wanted me to make sure they were our bags -- again he walked me around security and over railings to get back out. When at the car, he held out his hand, and said 'I worked hard for you'! He wanted more money. I asked him how much he wanted, and he just said 'I did a lot for you'. I gave the rest of the small bills I had -- $15 more. I agreed he had done a lot, but I also knew $35 was a ton of money in the that part of the world. I made it back to the ticket counter, waving again at all the security personnel, we got our tickets, and made it to the plane. 12:14. Wouldn't you know it -- the plane sat at the gate until 1:30 waiting on people and bags from another flight!!! All that for nothing. We had paid full fare for the first class seats on the Egypt Air flight from Cairo-Nairobi, figuring it was late at night and we would need to sleep. Little did we know that first class was really just 3 regular seats with armrests dividing the middle seat to make 2 larger seats. There was no extra room between rows, the seats barely reclined, and there were no other amenities. They offered water or juice (no alcohol) only once, and the meal they served was cold and hard. The first class section was full with Egyptian men all talking loudly and complaining about this or that, at 2AM! Then the person next to Kristen lit up a cigarette -- we could not believe it. I looked up and confirmed that the no-smoking sign was lit, and called the flight attendant over. I pointed to the sign, and said "isn't this non-smoking, the light is on. " She said, "oh, no, it is ok. do you want a cigarette?". I was quite annoyed. The guy ended up switching seats with the person behind Kristen for some reason, but continued to smoke cigarette after cigarette. In the uncomfortable seats and the smoke-filled air, we suffered sleeplessly to Nairobi. We have forever removed Egypt Air from our list of potential airlines to use, and we now know to specifically ask whether an airline allows smoking before buying tickets! On our return from the Kilimanjaro climb, we had to drive from Arusha, TZ to Nairobi because Tonya needed to make a flight to Johannesburg and there was no way to fly to Nairobi in time. One A&K driver drove us to the border of Tanzania/Kenya from Arusha, then another A&K driver drove us from the border to Nairobi. Supposedly, there are significant issues with getting cars across the border. As we expected, the immigration effort getting into Kenya was much more difficult than getting into or leaving Tanzania. However, the A&K driver pushed his way to the 'special' line and expedited our passage. norfoh@nbnet.co.ke Supposedly the nicest hotel in Nairobi. Rate for tourists is somewhat high.